New York Wellesley Club Celebrates 125th Anniversary, Mayor Bill de Blasio Declares "New York Wellesley Club Day"
The first meeting of New York Wellesley Club (NYWC) took place on December 13, 1890, just 11 years after Wellesley College graduated its first class of 18 women. Today, the NYWC serves nearly 2,700 alumnae in the city's five boroughs. "What a combination," said Lynn Sherr '63. "A Wellesley degree and a New York City ZIP code. The alchemy of these two critical places is more than magical, enabling and inspiring so many of us with intellect and energy, ambition and diversity. We thrive on each other, and I’m grateful to have both in my life." On Saturday, November 14, the club marked its 125th year with a celebration that gathered more than 400 alumnae, including Sherr, a journalist who interviewed President H. Kim Bottomly as part of the event. Over the course of the daylong celebration, alumnae leaders shared their perspectives on how Wellesley has prepared them to become leaders. 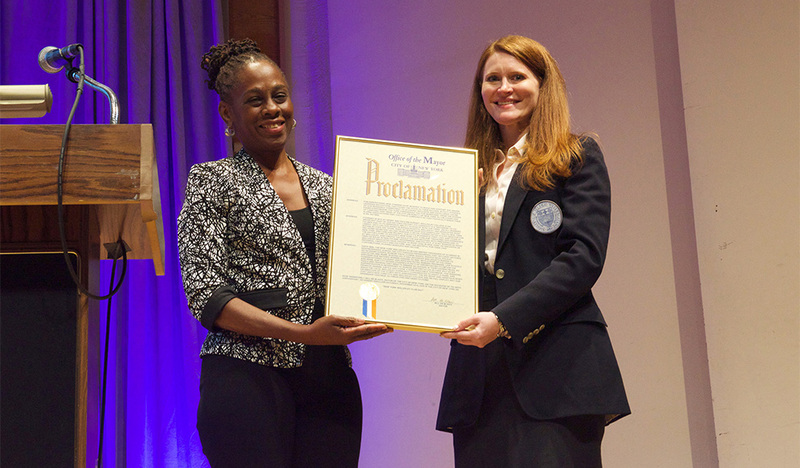 First Lady of NYC Chirlane McCray '76, a special guest, delivered welcome remarks and presented a proclamation from Mayor Bill de Blasio declaring November 14, 2015 "New York Wellesley Club Day." An excerpt from the proclamation read: "Wellesley College is an important part of our nation's history... It is no wonder so many Wellesley graduates have chosen to make lives in New York, an epicenter of progress, creativity, and culture, and I am grateful for their contributions to every borough and sector." Held at the Kaufman Music Center, the event drew alumnae spanning the generations including: professor and historian of education Diane Ravitch '60; StoryCorps CEO Robin Sparkman '91; Lindsey Boylan '06, chief of staff at Empire State Development (New York state’s chief economic development agency); Elizabeth Barlow Rogers '57, founding president of the Central Park Conservancy; Erika Symmonds '02, co-founder of New York's Green City Force; Barbara Goldsmith '53, elected a "Living Landmark" by the NY Landmarks Conservancy; Lulu Chow Wang '66, founder of Tupelo Capital Management; Marcia Stein '61, founder of Citymeals-on-Wheels; CNBC’s chief international correspondent Michelle Caruso-Cabrera '91; Aisha Christian '95, general counsel for Rent the Runway; Milly Glimcher '61, co-founder of Pace Gallery; Katherine Johnson '03, personal secretary to President Barack Obama from 2009 to 2011; and Nicki Tanner '57, trustee of New York Community Trust, New York Public Radio, and the Jewish Women’s Archive. "Everywhere I turn, across every facet of this city, from boardrooms to news rooms and everything in between, Wellesley women are right there at the center, shaping the future of New York," said Boylan.